If you’re a follower of TBFS you may already know that I’m a crazy huge fan of Mexican food. I have soooo many delicious Mexican recipes on my site–probably more than any other type of cuisine–because I LOVE it! My husband and I lived in Puebla, Mexico for a few months when we were first married. I learned to make several authentic recipes while we lived there, but this Authentic Mexican rice is the one I use the very most. (You can check out some photos from our time there, and the story, here). 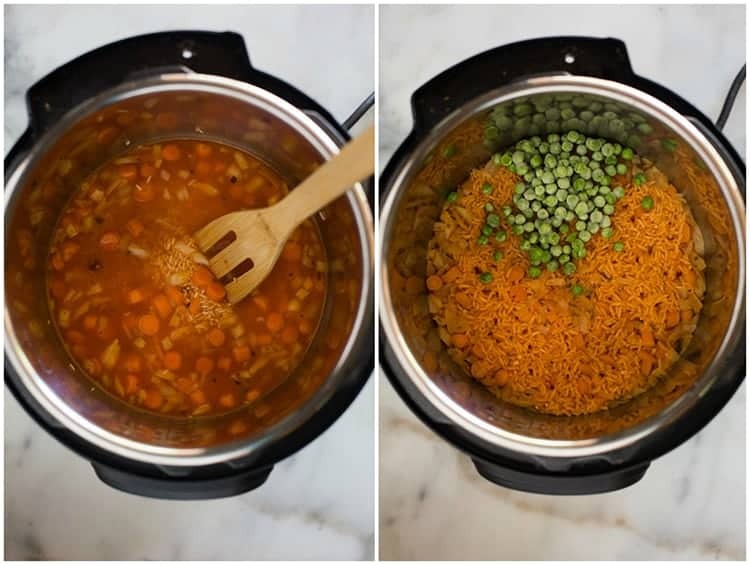 I’ve adapted my recipe to make Instant Pot Mexican Rice, and it turns out PERFECT. 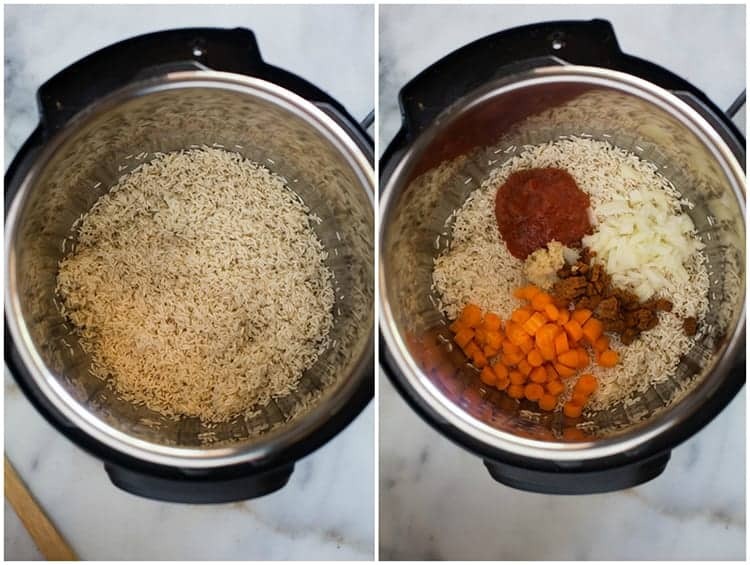 I love the way the instant pot cooks rice. You don’t have to worry about mushy or gloopy rice. It’s fluffy and tender, and exactly how rice should be! Mexican rice is made of long-grain white rice, tomato, onion and garlic. In Mexico it is also often cooked with diced peas and carrots. The chef who taught me to make Mexican rice used Tomato bullion cubes for extra great flavor, and to get that perfect orange color that you’re looking for. They should be easy to find at your local grocery store, in the Mexican food aisle. You could even buy the granules instead of cubes (use 2 teaspoons). I buy tomato boullion at Walmart, in the Mexican food aisle or you can find them on Amazon. Rinse the rice under water until the water runs clear. Drain well. Turn instant pot to the saute setting. Add oil and rice and stir often, until the rice starts to get slightly golden. Add tomato sauce, minced garlic, onion, tomato boullion and diced carrots. Stir well. Add water and stir, making sure the boullion cubes are dissolved. Turn instant pot off. Secure lid and turn valve to sealed position. 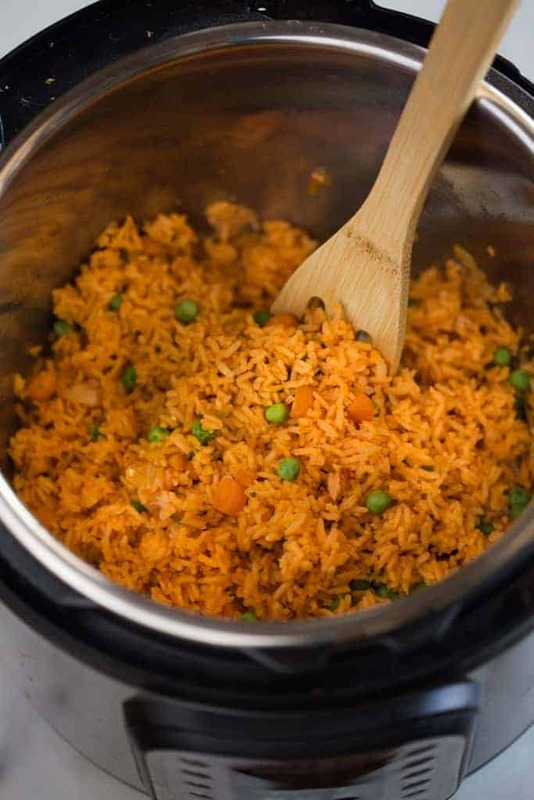 Turn on to Manual or High Pressure, and cook for 3-4 minutes (3 minutes for tender to the bite, or 4 minutes for softer rice). When timer beeps, allow pressure to naturally release for 10 minutes. Remove lid and add peas. Gently fluff the rice with a fork (don’t stir it). Place IP lid over the bowl and allow rice to rest for a few more minutes before serving. 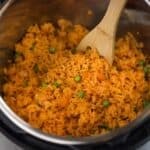 If you don’t own an instant pot yet, you can make Authentic Mexican Rice on the stovetop with this recipe. 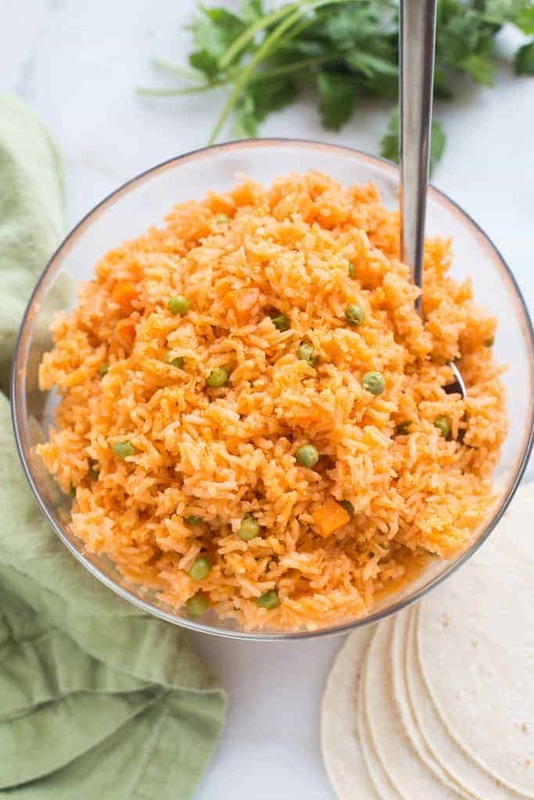 This Instant Pot Mexican Rice recipe is my favorite side-dish for any Mexican food we eat! I perfected this recipe while living in Mexico-- it's completely authentic-- and I've adapted it to cook perfectly in the Instant Pot! Rinse the rice until the water runs clear. Drain well. Turn Instant Pot to saute. Once hot, add oil to the bottom of the pot. Add rice and saute, stirring often, until lightly golden, about 5 minutes. Add garlic, onion, tomato sauce, salt, tomato bullion and carrots and stir to combine. Add water and stir well, making sure the bullion cubes are dissolved. Remove lid and add peas. Gently fluff the rice with a fork (don't stir it). *Tomato bouillon cubes or granules can be found in the Mexican food at your local grocery store. You could substitute chicken broth, but the rice wont have the same rich color. Don't own an Instant Pot? No Problem! Find my tips (and step-by-step photos) for cooking perfect mexican rice, above in the post. This post contains affiliate links. I love sharing my favorite products and cooking tools with you all! This was one of the first recipes I saved when I got my Instant Pot after Christmas! I finally made it tonight for dinner! It was so good! The changes I made were using frozen corn vs peas. I also added some cumin, pepper and smoked paprika when finished. Next time, I will add these in the beginning. Thank you for the great recipe! How much cumin, pepper and paprika did you add? Substituted 2 teaspoons of tomato paste for the boullion and it came out great! I’m excited to play with more seasonings next time. Don’t be mistaken, though, because this was great as is. The amount of water called for in this recipe is not enough. All I got was a burn error on my instant pot. Typically when I make stove top Mexican rice I add 2 cups of liquid for every cup of rice. Am I missing something here? The Instant Pot only requires a 1:1 ratio for white rice and water. If you have a newer instant pot they are much more sensitive to the burn notice, so check you manual to see what the minimum liquid requirements are. Is the cooking time the same if I double the recipe? And do you double all the ingredients too? Thanks for your help.